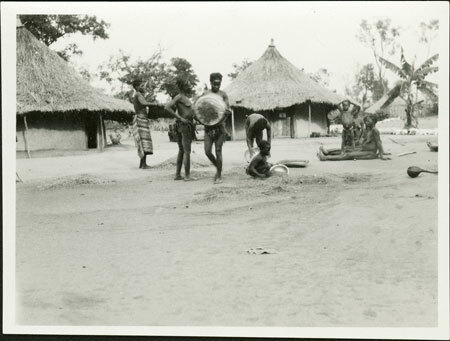 A group of women and children within a homestead winnowing eleusine coracana (a type of millet crop that also forms the basis of beer-brewing) with sleeping huts in the background. This crop was once the most important base for porridge and beer, but has been displaced to some extent by manioc, a highly drought and pest resistent tuber, which is however somewhat less nutrious than flour produced from grain such as eleusine. Morton, Chris. "Zande women winnowing eleusine" Southern Sudan Project (in development). 03 Jan. 2006. Pitt Rivers Museum. <http://southernsudan.prm.ox.ac.uk/details/1998.341.119.2/>.